These pages are brought to you courtesy of Kevin Doyle and Frank Kern in order to provide a reference for collectors of Scouting's "hat-shaped" patches. "Hat patches" are called that because their shape looks like a hat, when viewed from the side. The shape, though is actually functional: it provides a place for segments for events and awards arranged around the crown. Below are two examples of hatPatches and their segments. Hat-shaped patches have been issued by councils, by camps and occasionally to commemorate events. Their heyday seems to have been from the 50s into the early 70s, though the occasional new issue still turns up from time to time. We owe a debt of grattitude to Prince Watkin's Local Council Identification of the Boy Scouts of America, first edition, for its identification of issues of this uncommon genre. Special thanks to Tim Brown, Chris Jensen, Brent Clark, Bob Cylkowski, Steve Narolski, Hank and Jonathan Personius, Jim Taylor, Rich McNamara, Matthew Whitworth, Steve DeWick and Rick Rolf who have provided scans. While we hope the site is somewhat complete, a new hat shape seems to crop up avery six months or so. If you know oif a hat shape that is not depicted here, please let us know. 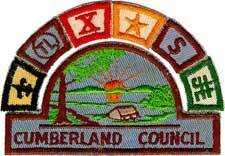 Cumberland Council hatPatch with segments. 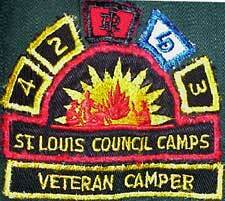 St. Louis Council hatPatch with segments and a VETERAN CAMPER base segment.